Last April, we took the long way home from Florida. We had never seen the Outer Banks of North Carolina so we decided to spend a few days there and check it out. The weather wasn't the best- overcast and really windy- but we enjoyed seeing the sea shore and the history. The photo above is where Wilbur and Orville Wright launched their glider like plane with success. They took turns being captain and the markers show how far each attempt got. All the restaurants around served clam chowder and since it was chilly, soup hit the spot. When I got home I wanted to make some, but recipes that called for boiling clam or shrimp shells to get broth really put me off. Who's got the time or patience for that? 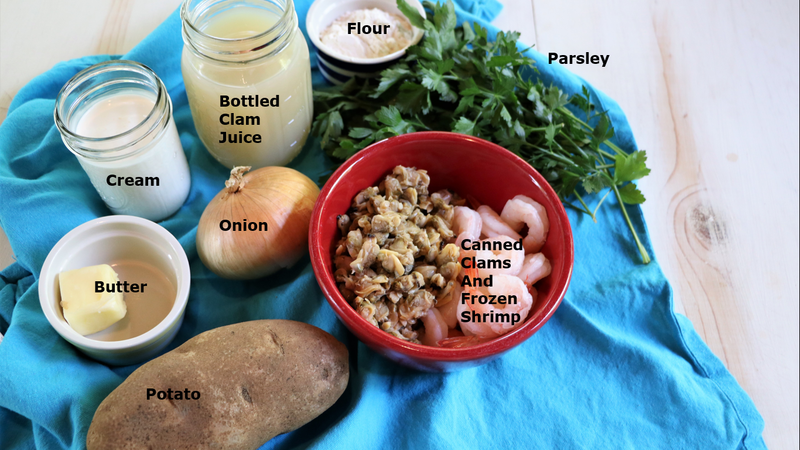 I found that bottled clam juice, frozen shrimp, and canned clams were the way to go to make speedy but tasty seafood chowder.